Netcomm have 2 general families of modems: AutoModemTM and SmartModemTM. Automodems are for the general end user market: People who mainly dialout to Internet Service Providers and Bulletin Board Systems. SmartModem products are designed for the high end market: BBS's, Mainframes, Unix machines, MUX's and POS stations and situations where high security and reliability are paramount. The Roadster AutoModem family comprises of the Roadster 336, Roadster II 56Ultra, Roadster 56Flex and Roadster Ultra SVD modems, providing both data and fax communications. Netcomm Modems come bundled with everything you need to get started right out of the box. Installation is a breeze, with versions available for both IBM PC and Macintosh Environments. Offering high speed data up to 33600 bps. Support for 56k Flex standard. Fax send and receive - Class I and II at up to 14400bps. Winfax (V8.0) fax communications package included. Simultaneous Voice and Data transmission. The InModem336, The InPlus336 SVD and InModem56 provides data and fax communications using any spare 8bit 1/2 card slot found in most desktop computers, with identical performance and specifications as the Roadster family. As with the Roadsters, the InModem comes with everything needed to get started right out of the box, including Winfax (V8.0) for Windows 95/NT, one of the world's most advanced but easy to use fax communications packages. For Laptop and Portable computer users the Netcomm CardModem range is the ideal solution. All three models ( CardModem336, CardModem56 and Socket Rocket 336 ) provide the same features and functionality as their equivalent Netcomm AutoModems and SmartModems, using the standard PCMCIA (Type II) connection system. High Speed data up to 33600bps. Fax send and receive - Class I, II at up to 14.400bps. The SmartModem range is the ideal option for the professional user as it provides functionality, flexibility and high performance from a modem utilising 16-bit technology. The SmartModem range also offers fax capability, at up to14400bps Group III, class 1 & 2. 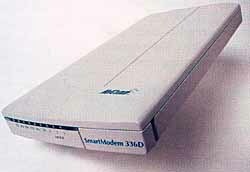 The SmartModem Family comprises the SmartModem 336 and the SmartModem 56. Supports new V90 56k and 56k Flex data standards. Fax send and receive - Group III, Class 1 & 2 at up to 14400bps. Full security features - Defence of Department approved DES encryption. Standard telephone (PSTN) and leased line capable. Supports sync and async operation. Copyright ©1997 ZCM Services, Australia. Last updated on October 9, 1998.